and clear Swarovski crystals on a silverplated base. 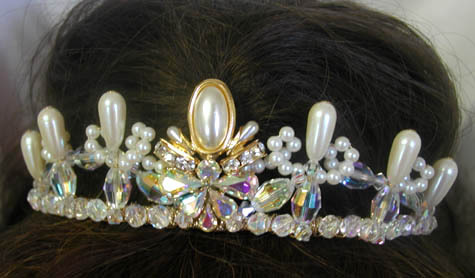 It can be worn a as a small tiara or as a comb. It measures 7/8" wide X 5" long. 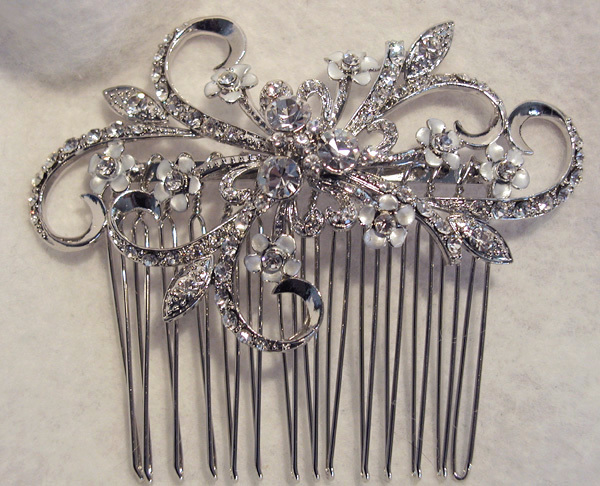 This lovely rhodium-plated Swarovski rhinestone crystal and pearl bridal comb originally sold on our website for $145.00. We are discontinuing this style and only have one comb left. The comb is 6" long X 2" wide. It's gorgeous for a bride or member of the bridal party. 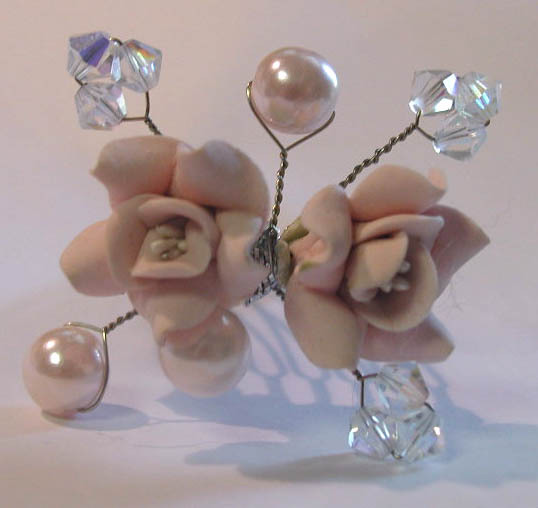 is embellished with hand-sewn white glass pearls and iridescent Swarovski crystals. The circumference of the bun wrap is 19". 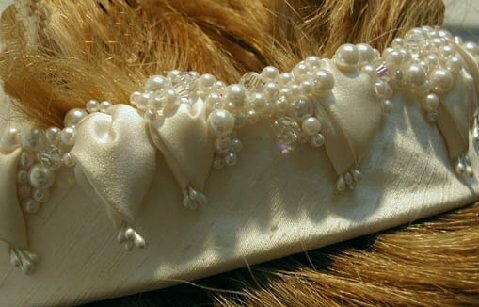 The wrist length veil is 3-layer plain edge diamond white with scattered pearls and detaches with velcro. The veil is 72" wide X 36"/ 30"/ 24"
This is our exclusive petite BAROQUE BOW rhodium-plated Swarovski crystal barrette. 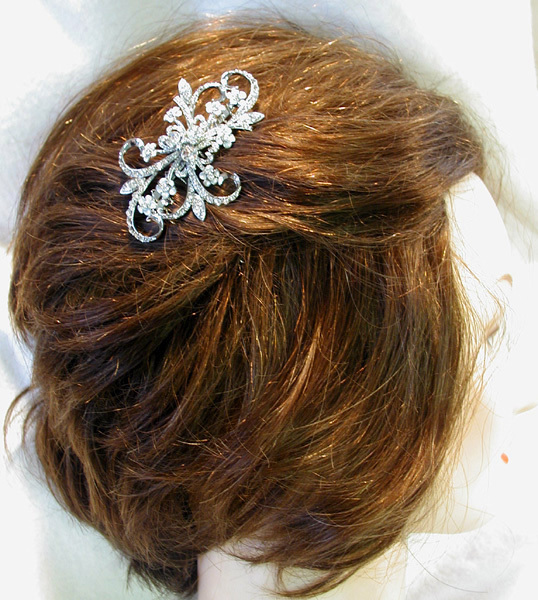 This sparkling little barrette is encrusted with small hand-set Swarovski rhinestones. The barrette is 2 3/8" long X 1 1/8" wide. only have one barrette left. It originally sold for $65.00 in bridal shops. It's gorgeous for a flower girl, member of the bridal party or for a communion. This headband 1" wide and is in perfect new condition. Only 1 headband is available. 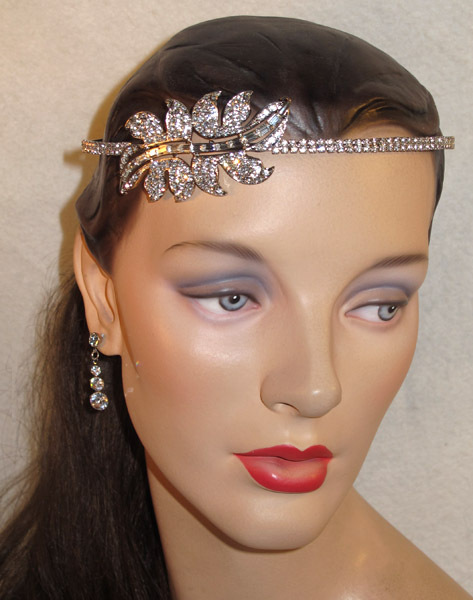 We are offering this gorgeous headpiece at a special price while supplies last. The decorative portion is 3" long X 1 5/8" wide. The headband base is 14 1/2" long. 1 5/8" tall and 6 1/2" long along the base of the design. 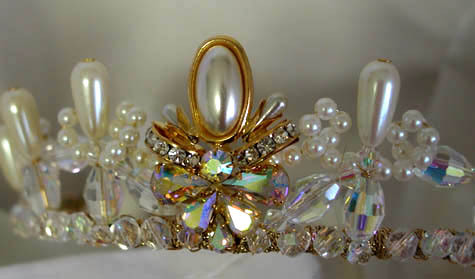 It is made with iridescent Swarovski and Czech crystals and Swarovski rhinestone crystals on a goldtone base. It attaches with combs at the ends. We have one tiara with white pearls. 1 3/4" wide at the center. Wear it on the side or on the back of your head. This comb has been discontinued. We only have a limited number available. This headband 3/4" wide and is in perfect new condition. This headband 7/8" wide and is in perfect new condition. The headband is new and in perfect condion.